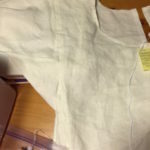 smock – an undergarment or skin layer of rectangular construction, made of white or unbleached fabric, not meant to be seen when worn. Example: this very piece, right here. tunic – a first or second layer (outward from the skin, that is; there may or may not be another garment beneath it) meant to be visible when worn; may be as high as hip length or as low as floor length. Example: my lavender Viking tunic. 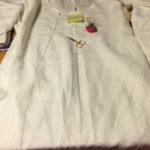 kirtle – a word that could mean either a smock or a tunic. camisa – Spanish for any and all of the above; I use this term more often to refer to a smock that is patterned by draping it on the body and pinning until it is tight up against the skin, thus making a very fitted, supportive garment. Please note that this is my terminology. In both medieval and modern times and in many places, all these terms could be interchangeable; they could also be considered very different. One of them isn’t even English; I use it because my persona is Spanish, and also to mentally differentiate a fitted, supportive undergarment (camisa) from a rectangular-construction, loose smock. Now that that’s all settled, let’s talk about this particular smock. The pattern/method I’m using is the exact same one that I used for my Lavender Viking Tunic. 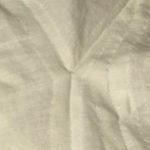 The fabric is also linen, but of a different weight and feel. 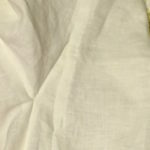 Whereas the lavender was heavy, somewhat coarse, and definitely opaque, this white is a very lightweight linen, much smoother, and a little bit sheer. That’ll be one big reason why it’s meant to be used only as an undergarment. I don’t have pictures of every part of the making process. 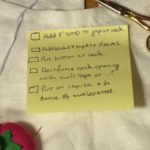 I’ve found to my chagrin that once I get my head down and get absorbed in the sewing, I seldom remember to look around at anything else, including the camera that was sitting right there. To begin making the pattern — or, rather, checking to see whether the pattern for my Lavender Viking Tunic was still accurate for my current body — I had someone take my measurements: arm length from the point of the shoulder to the narrow point of my wrist; from the point of the shoulder to the thickest part of my bicep; and from the point of the shoulder to the thickest part of the forearm; and then around my fist, my forearm, my bicep, and my armscye (the circumference of my shoulder, around at the armpit). I used the fist, not the wrist, because I wanted to be able to get my hand through the opening. To each measurement I added one inch, because I like a half-inch seam allowance at every edge. Then I compared these measurements with those taken when I was first measured for the lavender tunic: a match. Now I could proceed. 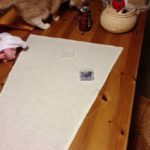 I laid out my fabric, folded in half lengthwise. On my fabric I drew a chalk line perpendicular to the fold line, measuring one-half of my bicep measurement plus one inch. 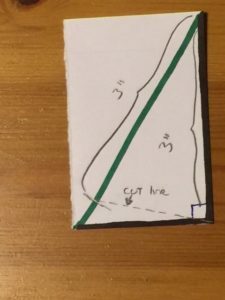 I then measured down the fold line, the length of my shoulder-to-wrist measurement plus one inch; then drew another line perpendicular to the fold line at one-half of the fist diameter measurement. I joined the outside point of each of those perpendicular lines together, making a line that slanted. I wish I’d taken a better picture of this, but here’s the idea. The line I drew was from the * at the top to the * at the bottom. 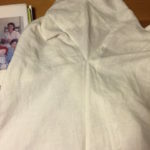 However, I could not cut out the sleeve yet. Because my arms are quite muscular and beefy, I wondered if a trapezoid that went around my bicep at the top and around my fist at the bottom might still be too narrow at the forearm or the bicep, so here’s how I determined whether that was true: I took the measurement from shoulder to forearm (the widest part of my forearm, that is) and drew a line down the fold until that point, then drew a line from that point, outward, at a distance of one-half my forearm measurement. Since that distance wasn’t quite out as far as the line from * to * (bicep circumference, but measured at the shoulder point) to wrist circumference, I knew that my forearm would still fit inside the sleeve. I think this demonstrates the geometric manipulations, at least a little bit. –> If the bicep (or forearm) measurement had been a bit larger, the outer point of that forearm line would have fallen outside my initial trapezoid. At that point, I would have enlarged the sleeve: instead of having the outer line of the sleeve go from the shoulder to the wrist point, I’d have drawn it straight from the shoulder to the bicep (or forearm), then extended it down until it met up with the wrist-line in length. I didn’t have to do that, but I figured having this basic instruction down will help someone at some point. So, take note, those with big Comic Book Hero muscles: use the largest circumference on your arm as the “armscye” measurement, whether that’s your actual armscye, your bicep, or your forearm (Popeye springs to mind); and the second-largest measurement as your “wrist/fist” measurement, even if it’s your forearm. 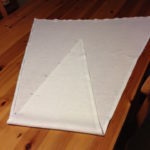 Once I was certain of the size and shape of each sleeve piece, I cut them out, marked each one with a line one-half inch from each edge, then hemmed around each side using the elizabethan seam method. 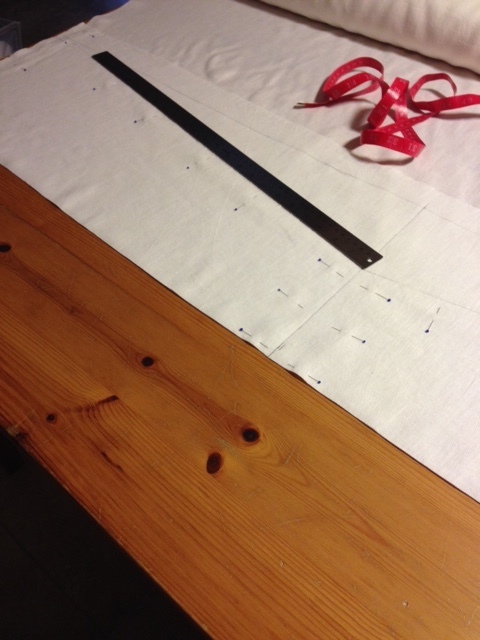 To cut my gores, I measured a rectangle of the correct height on my fabric, then cut off the entire piece. I folded it in half, sideways, and drew a diagonal line from one corner to another. I pinned, then cut along the line. I was then left with one isosceles triangle which became the back gore, and two right triangles which became the side gores. Normally I know people like a front gore, but I prefer a smooth front. For one thing, front gores get between my legs when I walk, and I find it annoying. For another, I have already been blessed with a good fullness of figure, so I don’t need to compensate by enlarging the visual appearance of my midsection. I marked each piece with a line one-half inch from each edge, then folded along that line and pinned it into place. The final line is crisper if you press the line into place. Rather than get out the iron, you could also use the handle of a butter knife, a burnishing tool, a letter opener, or anything else that’s flat and smooth. But fingers were handy (see what I did there? ), so that’s what I used. It’s actually best to do this before/while pinning, as it will probably affect the placement of the pins. 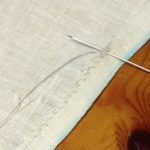 Then I began to whipstitch over the raw edge of the fabric. 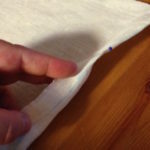 I could also have folded the half-inch seam allowance in half again and rolled it up, hiding the raw edge. However, I was following the advice of the Extreme Costumer, and wanted to try her method (http://www.extremecostuming.com/articles/theelizabethanseam.html) for an entire garment and see how I liked it before going back to what was familiar to me. Look at those AWESOME stitches. In retrospect, I think I should have sewn them a little deeper into the seam allowance so they for sure wouldn’t fray. I might still go back over each one and re-sew it, but this should do, for now. Witness my two favorite assistants. The cat is Vashti. The can is Coke Zero. They are equally helpful. The back gore piece, folded up to display both sides of the pinned edges. Then I moved on to the body pieces. For this I needed to measure the circumference of my shoulders, breasts, stomach/waist, and hips: and I needed to take the largest of these three. It turned out to be a tie between my shoulders and my hips. That was the width of my front rectangle. The length is similarly easy: however long I want it to be. The tiny little area below the dashed line is the only waste that comes from cutting gores this way. Also, I owe my high school geometry teacher $50. You were right, Mr. Geismann. I totally use geometry on the daily. My next step was to sew the side gores to the front piece, the back pieces together up to the height of the back gore, and the gore to the back pieces. I then pinned the shoulders together, then flattened the gown out and drew on the neckline. The circle I needed was the circumference of my head, an easy thing to figure out. But the placement isn’t as intuitive. It can’t be centered from front to back, because I’d wind up with a very low neckline in back, and it would strangle me in the front. Human beings are just not symmetrical from front to back. Especially women, ya heard? So I measured my head, drew a circle of that circumference on a piece of paper, and set that paper down so that roughly 20% or 25% of it was in the back, while the rest was in front. Then I cut the circle out, and hemmed that edge. I then pinned the sleeves to the body, and pinned up the lower half of each sleeve so that it would actually act like a sleeve. For this, I needed assistance, so I asked Hakim to help me. I held my arms out to the sides, while he pinched the front and back of the garment together at the place where my torso is the narrowest. As it happens, that’s right at the level of the bottom edge of my bra. There he chalk-marked where the two halves came together on each side. Apparently that will be a couple of inches below where the gores come up to; I’ll figure out how that affects the piece later. 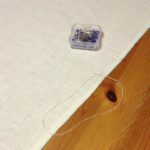 From there, I measured the distance between the armpit and the narrow place, added one inch, and that was the measure of each side of my square gores. Those were easy to cut and hem. 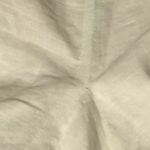 The Elizabethan seam join is smooth and attractive. In context, despite a few weird folds I couldn’t smooth out for the photograph, it’s easier to see the beauty of an underarm gusset made with the Elizabethan seam. Remember I told you that the underarm gusset came down lower than the side gore? Here’s how those two pieces come together. The downward-pointing V shape is the gusset; the skinny upward V-shape is the gore; and the fabric to the right and to the left are the front and back pieces of the gown. Another closeup of the underarm gusset-plus-gore join. Pulling back, you can also see both the gusset-gore join and the place where the gusset meets the sleeve at the top of the gusset. Coming back further, check out the join in context from the front of the smock. It doesn’t look nearly as weird (cool?) as I’d envisioned. Whew! 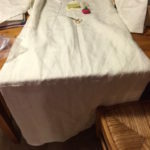 Now I could attach the front of the smock to the back, sewing together the sides from the top of each gore until the narrow part where Hakim had pinched and marked. Then came attaching the sleeve-and-gore compound pieces to the rest of the garment. One would think I was finished now, but one would be wrong. As full-length as I could get, what with the dining table being half-covered with sleeping cats and a stack of books I just bought. 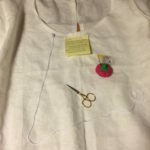 THERE IS STILL MORE TO DO ON THIS DRATTED SMOCK! put the garment on and do the dance of awesomeness in admiration for my own skills. About 3/4 of the way to finishing this garment, I was also realizing that my lavender tunic, based on this same pattern, wasn’t going to be all that comfortable for me. Rectangular construction is great in a lot of ways, but I really do prefer garments that fit my actual curves. I have a whole ‘nother blog post about that, though. The Elizabethan seam makes joining a lot easier. It stops the pieces from fraying before I can get the seams finished, because it starts with finishing them instead of making that the last step in the process. However, I might not be quite as delighted with the very tippy-tops of the gores as I want to be. I’ll need to sort out a slightly better method for that, I think. 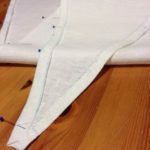 Another thing about the Elizabethan seam is that it’s nice and flat, meaning less bulk-adding at each seam. However, because the raw end is simply whipstitched over instead of folded out of sight, I get the feeling it might irritate my skin. I might wind up picking out all that work and re-doing it, this time with folded edges. Given my rather insistent tactile issues, I feel a little bit dumb about that, but as they say, live and learn. Next time I will cut off the extra dangly bit of the gore before I bother hemming that edge. I am a little bit dismayed that I didn’t even consider that beforehand. Next time I will perform all the geometry on paper, then lay the paper on my fabric and pin, just like any other patterned garment. Such light fabric as this tends to distort when I do the rip-along-the-grain thing, and I did not like what that did to the straightness of each edge or the way each edge fit against each other edge. Disappointing, really. All in all, I am glad I made this garment. Will I make another one like it? Probably, but next time I hope I’ll be smarter about it, so that I’m not quite as irritated at the results. It’ll look okay, but I suspect this first iteration of the white smock will be a little less physically comfortable than I want. Still, I’m going to be terribly proud of it, because it’s my first garment in which no one had to come over, show me what I was doing wrong, and show me how to fix it. This garment is mine in a way that the previous ones haven’t been. But because it’s going to be uncomfortable, I’m not going to call it wearable. It’s going in the pile of things that I might wear, as a very last resort, if all my other garb gets disgustingly dirty and there’s still a day or two left of an extended event. But only until I can make enough undergarments that I consider successful, and then it’s going to Gold Key for someone with fewer tactile issues.